Providing you the best range of shell and tube heat exchangers with effective & timely delivery. We are leading manufacturer, Importers and Service Provider of Shell and Tube Heat Exchangers and our product is made up of good quality. The range of heat exchangers that we are making available is known for trouble-free and efficient operation. It effectively transfers energy in the form of heat from one fluid to another fluid. Backed by enormous experience in this domain, we are instrumental in manufacturing and supplying a qualitative gamut of Shell and Tube Heat Exchangers. As these exchangers are made using premium quality steel, these have the high structural strength and longer service life. Owing to their superb features like high surface finish, excellent performance and easy maintenance, our heat exchangers are highly acknowledged in the market. 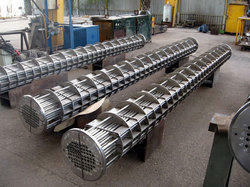 We offer these Shell and Tube Heat Exchangers in various specifications to our clients.